Fast setting, flexible white glue, with excellent resistance to moisture. Turns crystal clear when dry. Suitable for bonding exterior, and exposed to water, wood structures like pergolas and window frames. Bond securely oak doors, even wood stairs and wood floors, while protecting the bond from moisture. 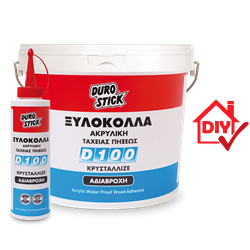 Use it also in shipbuilding and for all interior woodwork. Suitable for bonding cork and expanded or extruded polystyrene to concrete, wood and MDF as well as plaster and brick. Distinguished at furniture building and construction with hard or soft woods, such as beech, oak, walnut, oregon, rosewood, mahogany, and Swedish. It applies white and becomes crystal clear when dry. Classified D3 per EN 204/205 and D2F per EN 12004.